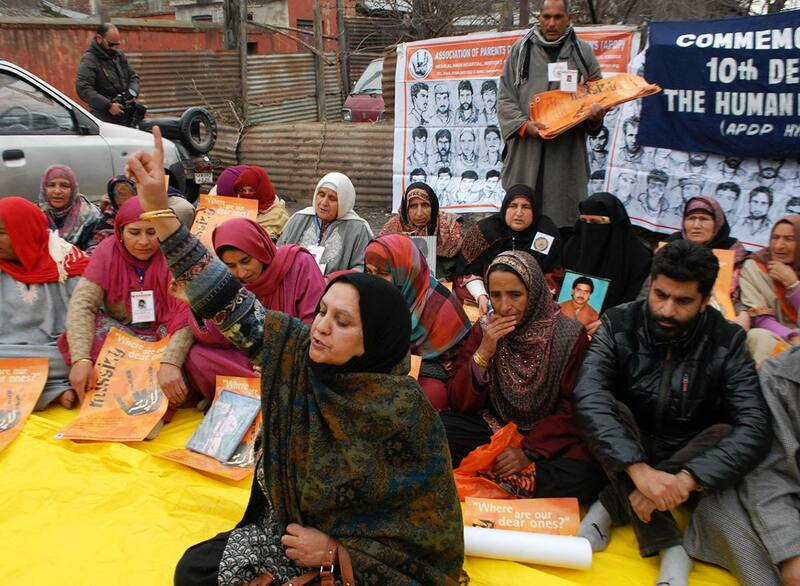 Parveena Ahangar along with other Association of Parents of Disappeared Persons (APDP) members during a sit-in in Srinagar. On 21 March 2016, the International Criminal Court [ICC] convicted Jean-Pierre Bemba Gombo, a Congolese national, for war crimes and crimes against humanity committed by soldiers under his effective control between 2002 and 2003 in the Central African Republic. He is yet to be sentenced. On 24 March 2016, the International Criminal Tribunal for the former Yugoslavia [ICTY] convicted and sentenced [40 years] Radovan Karadzic, President of Republic Srpska and Supreme Commander of the armed forces, for genocide, crimes against humanity and war crimes committed in Bosnia and Herzegovina between 1992 and 1995. Both judgments re-affirm the internationally recognized principle that it is not only the person who pulls the trigger or physically perpetrates crime that is culpable. Persons in power who control, order, incite, plan, and fail to stop crime, are the true perpetrators of crime, the most responsible, and must be held accountable. With the aid of legal principles such as command responsibility and joint criminal enterprise, the international community has strived to deliver justice for victims of horrific crimes by targeting, investigating and prosecuting the men and women at the top and at the helm of affairs. In contrast to the movements for justice internationally, the Indian State has worked towards building structures of violence and impunity. In Jammu and Kashmir, 70,000+ killings, 8000+ enforced disappearances, mass torture and sexual violence, a majority committed by the armed forces, has resulted in zero prosecutions of armed forces personnel in civilian courts. A recent report by Jammu Kashmir Coalition of Civil Society, “Structures of Violence: The Indian State in Jammu and Kashmir” documented 333 cases where 972 armed forces personnel are accused of committing serious crimes. Despite evidence, there have been no prosecutions in these cases, as the government through all its institutions is ensuring impunity for the culpable officials. The reason for this absolute impunity is also due to the fact that many senior officials – political, military and police are individually and collectively responsible for the crimes. Ex-Chief of Police Kuldeep Khoda, Additional DG of Police SM Sahai, Ex-DIG Aashiq Bukhari, Ex-DIG Farooq Khan, Major General Ajay Saxena, Brigadier Deepak Bajaj, Colonel KS Dalal and many more senior officials amongst the Indian armed forces and police have directly been named in relationship to their role in various crimes. The widespread and the systematic nature of the human rights abuses in Jammu and Kashmir and the absolute impunity granted to the culpable officials, is only possible if the political leadership were themselves involved in directing these crimes or through their acquiescence were allowing the armed forces to carry out the crimes. In any case, the people of Jammu and Kashmir, urge the international community to institute a similar mechanism to investigate the crimes perpetrated institutionally and systematically in Jammu and Kashmir. In any future credible investigation, the role of Governors of Jammu and Kashmir from Jagmohan to N. N. Vohra, Chief Ministers like Farooq Abdullah, Mufti Sayed, Ghulam Nabi Azad and Omar Abdullah and most importantly the people at the helm of affairs of the Indian army and the overall military apparatus, like the Prime Ministers and the Home Ministers of India will definitely come under scrutiny.